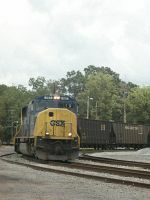 Description: CSX train Q127 sails around the curve off the Jesup sub at Folkston. Description: Twin SD70MACs - #767 & 768 - southbound on the UP mainline at the CSX/IHB diamonds, Dolton Junction. Description: SD70AC 767 leads empty hopper train E725 past the Brunswick Depot bound for Grafton, WV. Description: BC Rail 4625 heads east with Q620 in tow.